This really simplified it. I have pushed the other branches, too, however this is where I got stuck. There still is a context artifact but as said this lead nowhere so far. It's still in the ScalaCopy branch I should have deleted that probably. @hakra where is the Habits? If you overload at runtime, you do not need them specifically. You can just go along casting. What ircmaxell suggested for PHP decorator might be something useful, too, but I have not followed that much. But please feel free to check if my assumption about habits is correct. @hakra imo, it's not needed for Roles because they specify the Contract in the Interface and there is no need to access any of the methods of the actor. you just use the Role methods. @Gordon It was just a short though I had somewhere in between. I was offline so I could not further check if that decorator approach would be of use. One main lesson I learned is that traits in PHP is really limited. Do you think PC is dying? Feel free to exploit that example. I'm not 100% about habits, as you know I have problems with context. The Scala example does not have context and it merely works like this PHP one, however I do not know if the Scala example is complete or not. Coplien was quite confident about it however. @NikiC Scala has traits as first class citizen. For PHP also new Class() use Trait1, Trait2 implements Interface; to do some strict checkings maybe. One should probably extend the whole concept to anonymous classes in general, like Java has them. Q: Validation Class - Feedback Welcome! "Consider making individual validators rather than putting all of the different validation rules in one class. One option would be to make a Field class and have Form contain a collection of Fields (with each field having a collection of Validators)"
there are also some other PHP DCI examples. @I'll-Be-Back you dont want to use any of the superglobals directly because they are globals. Your code should not depend on $_SESSION or $_POST to exist somewhere and somehow. What if your code is run from CLI? There is no $_POST then. Inject them instead. @I'll-Be-Back: Do what Gordon writes, this will also allow you to validate other variables, not just request and session. okay got to hurry to the market otherwise I don't get any more stuff for the weekend. @Gordon Could you clarify "Inject them instead" ? btw @Gordon, how far is your thesis? @Gordon what is the purpose of second argument of session? @NikiC what did you finally decide to study btw? What text editor do you use by the way? @I'll-Be-Back yes, do so. it's a classic. there is no PHP examples in there though, just in case you expect that. @I'll-Be-Back you might also be interested in amazon.de/Head-First-Design-Patterns-Loukides/dp/0596007124 - covers all the patterns but with easy examples. @Gordon Easier to understand than "Design Patterns: Elements of Reusable Object-Oriented Software" book? anyone could you like help to me wordpress issues ? @Gordon By the way I personally think developer of PHP should rename all functions to be consistent and naming convention. However the old function name will still work as backward compatibility but no longer documented. What do you think? Sometimes I wish we could downvote comments. @Gordon You should do it :P Everyone will be very happy lol. Anyone has a followup on this? @karthys what is your issue? @Gordon I dunno if I'm immune to something, however it keeps rotating - and then? Is this common for Zend Framework? Q: Refactoring ZF Controller file? is there a SE site on wireless networks? Please [delv-pls] stackoverflow.com/a/12652983/367456 otherwise that wanted to be helpful user gets more and more downvotes. @hakra I suppose that's what happens when you steal a comment for your answer without knowing if it solves the problem or not. @hakra Yes, I'm not saying you're wrong, just commenting. if its about the data structure and database and maths i am good on it but ... i want to know prose and cones of every php function or line how do i know there things ? @Gordon sorry @Gordon, but I just hate such answers. @hekko php.net or any other mirror would be a good start. Chat rooms should have up vote and down vote near every line posted. down vote should decrease text size of the message and make text transparent as showing, that this isn't relevant/pointless. @Jocelyn I know. Just stated my opinion. @hakra does you comment have any point stackoverflow.com/questions/12653106/… ? @Eugene but it's the truth. @Gordon he was asking about book. So suggest a book for god sake. Those abstract answers are very annoying. If the point is to keep this chat room on float and just make a discussion on nothing, then sure, continue. @Eugene Basically saying: You can not get this little boy. I mean twitter will never offer that. You might can get this by scraping, but I assume that twitter protects against that. So it can only be fragile. @hakra So basically answer you should set is "twitter will never offer that"
@Eugene Which we can not give because we can not speak for twitter. @Eugene there is no expert level books for PHP. What should they contain anyway? I'd say that user is just moaning that such a thing does not exists. @Gordon Same stuff as Java books or OOP books with examples in PHP. And also there are some books with practical information about PHP. @hakra none. There is no logical answer to that. You can't speak for twitter and your answer will not have any point if you don't have a solution already. @hekko That is hard to grasp. Sounds a bit like code-review. @Eugene Well, I also close-voted it. But commenting is entertaining sometimes. You think I was offending? @Eugene if you want to learn OOP, then get a book about OOP on a language agnostic level. Same for Design Patterns. @hakra I would not say offending. Just pointless. You could use that time more productively. Search for a real solution yourself and propose it. Typing something that has no meaning is pointless. @Gordon design patterns are the best solution imho. Some of them can be easilly applied to specific programming language. @hekko if you want to become an expert programmer, google SOLID, buy GOF, buy POEAA, buy Clean Code, learn Refactoring, lookup GRASP, DDD, CQRS, DCI … but dont ask for PHP books. That's the most reasonable suggestion I can give you when you ask for Expert PHP books really. @Gordon oh no, let's leave it. A java programmer who loves PHP. Why should we kill it? So which kind of keywords are you speaking? Did you mean passwords? And what you mean by breaking them? Hey all, I need some PHP advice. What's the best way to keep someone from stealing your code? From what I've heard, obfuscation really doesn't work, and encryption is weird. @SomeKittens Tell in the license it is not allowed. blast. Is that really the only viable option? or maybe i am just being paranoid ..
@tereško What gives it away? Why is it a problem if I may ask? What is your audience? We make Joomla components. We're pretty much the only people offering what we do. @SomeKittens If they copy you, sue them. That simple. How is the rest linked? @SomeKittens That would mean everything is GPL right? @SomeKittens If you don't want people to copy you just don't release. @PeeHaa That's actually something we do fairly well. @PeeHaa good morning :) I've seen it has been late this morning. > I am also an avid medical cannabis fan. @vascowhite jup, it's a nice example now anyway I'd say. @hakra You had a PHP EOL list. Do you still have it somewhere? Was it on your blog? 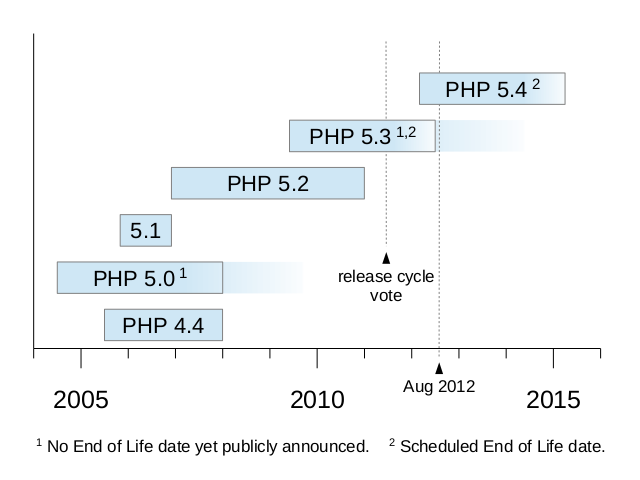 There is no official PHP 5.2 end of life date yet. Even asked for, the PHP devs in the mailinglist were not able to name one. I'm tired. I read that as PHP version 5.4 squared. well I should ask more than once probably. how to safe from ban meta.stackoverflow.com/questions/86997/… in last paragraph that says that ban is based on ip and we are using the pc on college where we share the same ip than ... what to do ? @hekko Well, you're fairly close to whoever got banned, so I'd punch them. @PeeHaa Sadly, I haven't looked into HTML5 other than when you guys post cool stuff here. Still trying to develop my PHP/Joomla skills to the point where I'm not a total noob. A: How do I loop through MySQL results in sections, with PHP? Best thing is, you can easily replace that with PDO with zero change of the code. is there anything i can do to reduce my account ban time ? Anybody who use Jira here? although...i'm not even seeing an account? @hekko and what about this account? Also you? @hekko "as far as i know"
hi. i have 2 arrays $firstname and $lastname each containing 1000 entries. How do I echo all double duplicates, i.e. where both firstname and last name are the same? Q: How to detect duplicate values in PHP array? @PeeHaa this solution only addresses a single array. I have two. The real question is: Why are you storing your data that way? @UnoMeinAme So array merge and check for dupes? Anybody up for a stupid JS question of me? Is there a way to put navigator.getUserMedia in a variable and call that? Or am I doing it the stupid way? this is for media streaming? That only check whether it is supported at all. I want to get the one method that is supported and add that to a variable to later be able to use it. or you want the one userMedia to rule them all. Could anyone please help with my CSS issue?! this is nested in here and that is now the issue. @Jocelyn Nah. We're talking about JS, so it can't be the JS room. @SomeKittens Why? JS topics are actually not discussed in the JS room? @Jocelyn Have you ever been in the JS room? It's rarely on topic. Currently they're discussing PC specs and pizza. @rlemon Do I have to use .call or is somebody going to shoot me? sorry gotta run and grab food + coffee.. i'll attempt to help when I get home. @PeeHaa the accepted answer to this question is one of the less helpful as it doesn't even give the correct calculation to use.